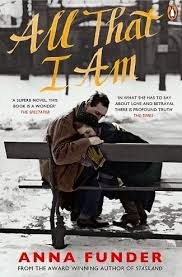 Anna Funder is the author of the novel All That I Am, and the nonfiction book Stasiland: Stories from Behind the Berlin Wall. She has worked as an international lawyer for the Australian government, and a documentary producer at the Australian Broadcasting Corporation. She grew up in Melbourne and Paris, and now lives in Brooklyn. Q: How did you come upon the story you tell in All That I Am, and how did you blend the fictional and historic elements? A: I was researching the life of my friend Ruth Blatt (1906-2001). Ruth was in the SWP, a small, left-wing anti-Hitler group, and had had to go into exile in London when Hitler came to power in 1933. So, I was researching the activities of anti-Hitler groups long before the war. Dora Fabian was in the same political party as Ruth, and also in exile in London in the early 1930s, and when I came across her story, and the ridiculous official reasons given for her death (along with her flatmate, the politician Mathilde Wurm) I knew that I wanted to write a book that represented the extraordinary courage these people had, and that restored us to them in some way. It fascinated me to find out about the very early, very prescient resistance to Hitler, so much of it led by Jewish intellectuals and activists. Q: Why did you decide to tell the story in alternating chapters from Ruth's and Toller's perspectives? A: Because between them their points of view build up an intimate portrait of Dora. No one knows everything about anyone; I wanted to avoid any hint of that kind of omniscience, whilst still making a "surround-sound" portrait of the time. Q: You've also written a nonfiction book, Stasiland. Did you consider writing Ruth's story as nonfiction? A: I considered writing Stasiland as fiction, but it just wasn't ethically or aesthetically appropriate to get into the heads of heroes, resisters or Stasi men who were still walking around Berlin and could talk for themselves. I felt they could be their own witnesses in history. With All That I Am the fundamental task was to get inside the heads of the characters to show what it feels like to be so brave, which is to say what it feels like to be so afraid, but continue what you are doing anyway in order to try to save others.